Written by Jean and Walter Kerr in 1944, the plot follows the novel by Franz Werfel, which is not a documentary but a historical novel blending fact and fiction. 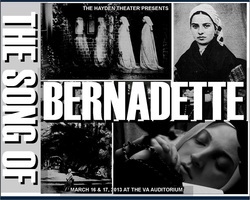 "The Song of Bernadette" is a venerative and sympathetic account of the life of Saint Bernadette Soubirous, a once pale and sickly (asthmatic) French peasant girl who claimed to have seen 18 miraculous visions of a "beautiful lady" (whom others insist must have been the Virgin Mary) near her home village of Lourdes in 1858. While her entire family neither supports nor encourages her claims, Bernadette's excitement and her sincere insistence that her visions were real eventually attract nationwide interest, luring a never ending stream of people to investigate. Her family and neighbors are a mixture of mostly skeptics, with just a few believers, and so evoke provocative questions about the Virgin's alleged messages and even of Bernadette's own spiritual worthiness.